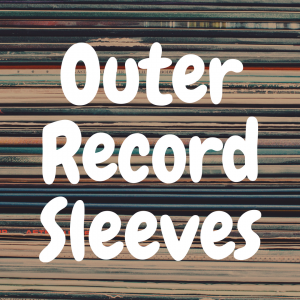 Being a newbie in the world of vinyl record buyers can be daunting. You just want to listen to vinyl records and not break the bank doing it. But what model of vinyl record turntable should you buy? There are quite a few options, and this is where the intimidation factor comes in. Record player setups require more thought than usual, because they demand a little more involvement than opening Spotify or popping in a CD. 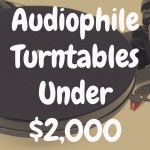 And below, please take a moment to view our interactive table, which allows you to compare many budget-friendly turntable currently available on the market. 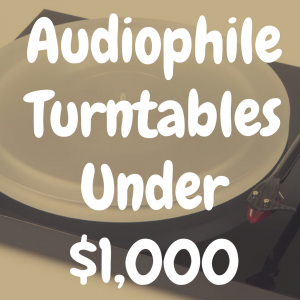 In this article, we’ll rank 10 of the cheaper turntables out there to better give you an idea about the advantages and drawbacks of each and help you ultimately find the perfect budget turntable for your needs. Sony has always been a solid name in electronics. The old adage that you get what you pay for applies especially to this stalwart pillar of the industry, and that’s not a bad thing. 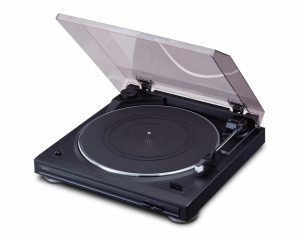 In fact, when it comes to the often high-priced world of record players, Sony gives “cheap” a much better name with its PSLX300 basic turntable model. Not only is this player outfitted with the essential technology to spin your favorite records (except, unfortunately, 78 rpm), it also features USB connectivity, an essential part of any modern music listener’s lifestyle. So now, you can convert your vinyl records to mp3 files and store them on your computer. Of course, that’s about it as far as features go. At this low price point, you’re not going to get much more than basic usability. The sound quality is strong, as you’d expect from Sony, but it’s budget strong. A leap in dollars will get you more in the auditory category. Now, let’s begin with the Audio-Technica AT-LP60. We’ve talked about the LP60 in other articles. This workhorse from a solid name in turntables does its job well at a bargain price. Everything about this model, from the switchable preamp setting to connect your turntable to anything, to the solid belt-drive core of the machine that produces surprisingly definitive sound, screams audiophile quality, but at a price that most audiophiles would sneer at. Actually, they probably wouldn’t, since Audio Technica is a name preferred by professional DJs. Pro tip: when you’re looking for a turntable, the one the DJ is scratching at your favorite night club is a good place to start. 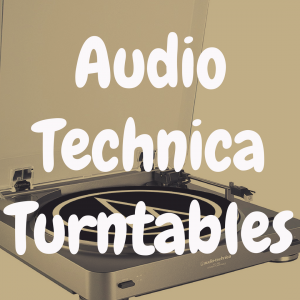 You can read our review of the Audio Technica LP60 here. 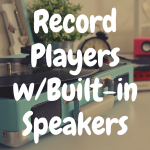 Crosley is another name we mention over and over again, and the Cruiser is one of its most reliable, and portable, models. What more can we say about it? Belt drive, built-in speakers, plug-and-play portable device compatibility. And that sleek, 1960s suitcase look that will have all your friends turning their heads. If you’re just beginning in the world of turntables, but still want to look cool doing it, carry this thing to your next house party. 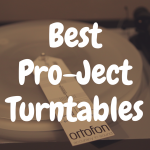 You won’t have the best sound of course, but you’ll have the best looking turntable, and sometimes in the vinyl world, where aesthetics sit alongside music, that’s all a music listener on a budget can ask for. 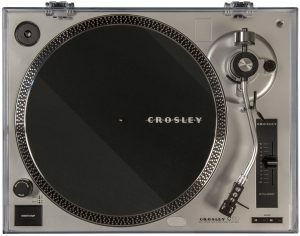 You can also read our article entitled Are Crosley Record Players Bad for Beginners? There’s nothing basic about the Orbit Basic, except that it’s basically a player for beginner vinyl listeners that want to begin their journey with audiophile tools. This player is an exercise in minimalist design and maximalist quality. It’s simple design means it won’t take much to get it up and running. It contains an Audio-Technica cartridge, which puts it on the right track in terms of sound. It has a low-res platter, vibration dampening, and it comes in a number of cool colors. It will do the job and make you look like a pro doing it, at an amateur price. Very few bad things to say about this strong player. The C100 is the less portable, but sound-upgraded version of the Cruiser. This is the one you pick up when you graduate to a more serious level of vinyl appreciation. With a solid turntable bed and sleek metallic design, this thing is an upgrade in durability as much as style and sound. You’ll need external speakers for this one, but once you get them, you’ll definitely understand the difference between this and the built-in model you used to have. S-shaped tonearm and counterweight also add optimal features, making this as close as you can get to higher end turntables without being higher end. The sound still isn’t quite there yet on this unit, but it has the feel of a top line player, and sometimes feel is what matters in an analog format. 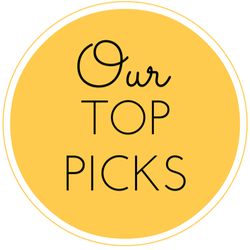 You can read our review of the Crosley C100A right here. Denon’s DP-300F is a step up to the next level. This is where players get slightly less affordable but way more serviceable in the quality department. And Denon doesn’t just serve; it excels. Featuring all the bells and whistles you want from a top player, including highlights like an automatic start button and extremely balanced tonearm for ultimate playback stability, there really isn’t much more that needs to be said about this player besides the obvious: if you’re in the market, get it. You can read our review of the Denon DP-300F here. Another mid-cost turntable choice on the threshold of top line, the Primary from Pro-Ject is easy to set up and sounds great. Did we mention it’s easy to set up? That’s the best thing about this model. Beginners want quality without the fuss of getting there. The Primary shortens the learning curve and accelerates the high-quality listening. It’s also mechanically quiet and is made of solid parts, including sapphire bearings and an Ortofon cartridge. The only major drawback here is that the Primary might be too easy to use. Sometimes the complication of learning how turntables are set up makes you more prepared when something breaks down. But ease of use is at a premium for beginners, and this is as easy as top of the line comes. The Elemental is everything the Primary is, amped up to an even greater degree. Want ease of use? Still here. Quality parts? All here, but in many cases better. The one big difference you’ll notice is the shape. That’s because the Elemental is weighted at its gravity mass point by an anchor of artificial stone, which the manufacturer says is capable of absorbing everyday vibrations that may tamper with your sound. The design makes it look like a balance beam, and in many ways, that’s exactly what it is. The Elemental balances all the elements that make turntable listening a challenge, taking a little weight off the beginner buyer’s shoulders for a little more weight from their pocket. Another proponent of the “plug-and-play” style of record listening, British manufacturer Rega has created the RP1 for ease of use and audiophile quality at a price far below the usual. Sensing a pattern here? The higher we go in price, the longer we usually go in learning curve. 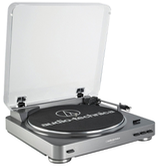 Not so with Rega and other new turntables that tout plug and play capability right of the box. They’re speaking directly to an audience that isn’t as familiar with turntables, but is intrigued by the sonic payoff they’ve heard so much about. With minimalist design meaning minimal design costs, Rega claims all the money goes into platters, tonearms, and bearings that are much higher above the price point in terms of quality. Naturally, this also implies that the parts won’t function the way they would with a multi-thousand-dollar model. 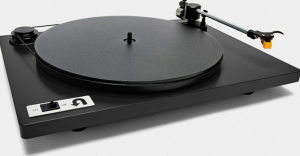 But Rega is a reliable manufacturer, and as a beginner, you’ll be enthralled by what you get here for your money. You can read our review of the Rega RP1 right here. The C556 from NAD offers much the same selling point as they Rega RP1: minimalist design with maximalist premium parts that make the C556 a steal at its price, and ease of use being the primary attracting point for beginning users who want the best without the mess of figuring out how to set it all up. There’s not much more that sets this apart from the RP1 or similar models. We include it last because it’s the most expensive, mostly meaning that NAD wasn’t willing to come down that far in price for what should be an expensive proposition. Perhaps the one thing that ticks it above similar models is the sound it provides. NAD are experts in that category, and it shouldn’t be underestimated even for a mid-range model.